Tickets for all newly announced American concerts go on sale to the general public beginning Saturday, June 29 at 10 AM through Ticketmaster. Advanced tickets will go on sale to American Express® Cardmembers beginning Monday, June 24 at 10 AM through Friday, June 28 at 10 PM. Tickets for the two Canadian concerts go on sale to the general public beginning Saturday, July 6 at 10 AM – the November 4 concert at Bell Centre tickets are available through Evenko.ca; the November 6 concert at Air Canada Centre tickets are available through Ticketmaster. American Express® Cardmembers can purchase advance tickets beginning Monday, July 1 at 10 AM local time through Friday, July 5 at 10 PM local time. The Eagles – Glenn Frey, Don Henley, Joe Walsh and Timothy B. Schmit – will perform classics spanning their career, including some that have never been performed live, as well as songs featured in History of the Eagles, the band’s acclaimed documentary that provides an unprecedented and intimate look into the history of the band and the legacy of its music. 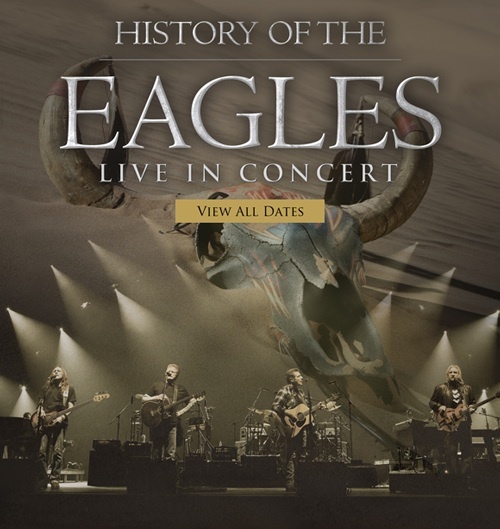 Available on DVD and Blu-ray, History of the Eagles is a meticulous creation featuring rare archival material, concert footage, and never-before seen home movies that explore the evolution and enduring popularity of one of the world’s biggest-selling and culturally significant American bands. Available through the usual retail outlets, online at Amazon.com and www.eaglesband.com, the package can be purchased through Ticketmaster when ordering concert tickets. History of the Eagles has already become the year’s best-selling music video.